LEPA being used on a row crop using drag socks to minimize erosion to the furrow dikes that limit water movement in the furrows. The author is an associate professor in the department of biological systems engineering located at the Irrigated Agriculture Research and Extension Center in Prosser, Wash. When center pivots were first introduced, they used high-pressure impact sprinklers on top of the pipe. These sprinklers needed 40 to 60 pounds per square inch (psi) to operate properly, were spaced 20 to 30 feet apart, and the irrigation application efficiency was about 60 percent, as measured by catch-can tests. Currently, most center pivots use mid-elevation spray application (MESA). These sprinklers typically use 15 to 20 psi pressure regulators, are spaced much closer together at about 10 feet apart, and the irrigation application efficiency is routinely measured at about 80 to 85 percent. Low Energy Precision Application (LEPA) and Low Elevation Spray Application (LESA) take that one step further to use 6 to 10 psi pressure regulators, the sprinkler drops are spaced 5 feet or less apart, and the irrigation application efficiency is improved to about 96 percent as measured by catch-can tests without a crop canopy. Lowering the sprinkler drops enhances efficiency and uses less energy; however, more drops are required to uniformly distribute the water. LEPA is a modification to the sprinkler configuration on center pivots or linear moves that minimizes evaporation and wind drift losses by running (dribbling) the water directly onto the soil surface at very low pressures, saving significant pumping energy and water. LESA is a similar modification, but uses a suspended sprinkler or spray head to spread the water out to apply it a little more uniformly than LEPA and also allows more time for the water to infiltrate into the soil. As a result, it has fewer problems with nonuniformity, crop germination, or with ponding and runoff compared LEPA. It, therefore, can be more flexible than LEPA with a wide variety of crops, row orientations, and tillage systems. LESA operating in a cornfield. The narrow spacing eliminates typical uniformity issues with MESA on wider spacings due to the canopy disrupting the application pattern. Although the canopy periodically held up the heads, no noticeable uniformity issues were observed even though the rows were not planted in a circle. Tests were done with catch cans to evaluate the differences in irrigation efficiency and uniformity of MESA versus LESA. These tests were done 10 different times, under different weather conditions, and the cans were dug in such that the can openings were level with the soil surface. In these experiments, an average of 81 percent of the water that left the MESA nozzles was collected in the catch cans. By comparison, an average of 96 percent of the water that left the LESA nozzles was collected in the catch cans. These differences were statically significant and translated to 18 percent more water reaching the ground with LESA when compared with MESA. These differences will likely be even higher when the LEPA or LESA sprinklers operate within a crop canopy. The LESA sprinklers had measurably poorer distribution uniformity. However, this may be of minor importance since the sprinklers are close enough together that the soil’s ability to move water laterally, and the crop roots’ ability to grow toward water can compensate for this lack of uniformity on a small scale. It might be compared to how a wetted furrow every 5 feet (irrigating every other row on a 30-inch spacing) can adequately irrigate a row crop. 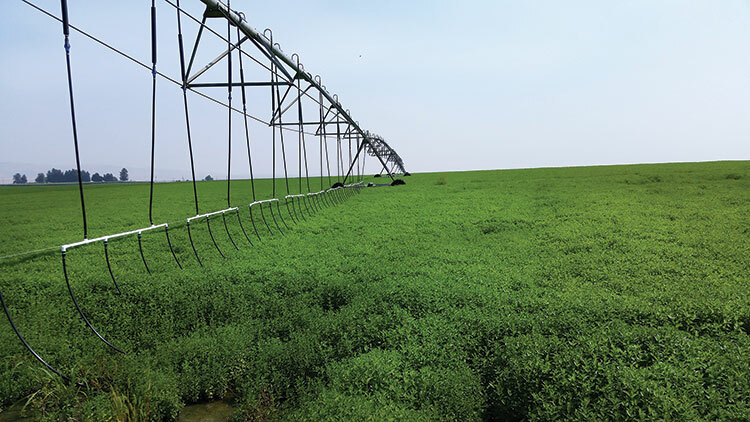 Deep-rooted crops like alfalfa are especially resilient to nonuniform water distribution if the variation is on a small scale like that of LEPA or LESA. LEPA, and to a lesser extent LESA, apply the same amount of water to the soil within a smaller radius and in less time than that of a pivot pass. Consequently, the risk of water runoff is elevated in fields with steep slopes and tight soils where runoff is already a problem. These types of fields probably shouldn’t convert to LEPA or LESA without first making changes to tillage or residue management practices that limit the elevated potential for runoff. 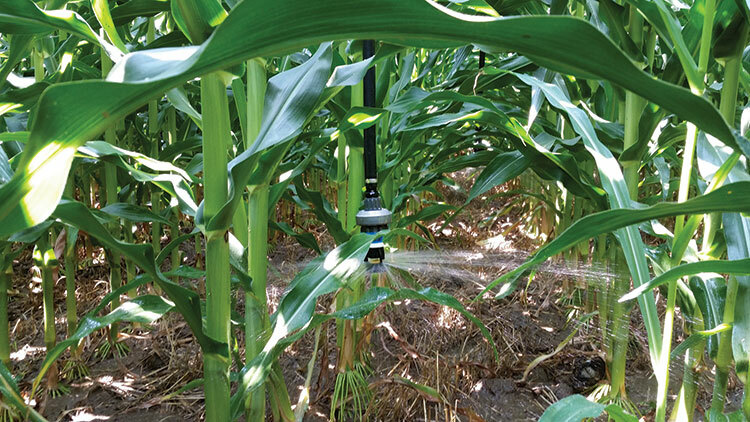 The lower flow per sprinkler also means that smaller nozzle sizes will be used throughout the pivot. These can get plugged easier unless the water is filtered for smaller debris particle sizes in the water. LEPA being used on mint. This setup allows conversion back to MESA for better crop germination, if desired. LEPA and LESA have been used successfully in Kansas and Texas for almost 20 years. This has been driven by the very acute water shortages that they have in these areas. Getting more water to the soil per gallon pumped translates into improved yields and higher profits. Trials and demonstration projects have been ongoing in the Pacific Northwest for the last four years. In many of these trials, the last span of a pivot was converted to LESA or LEPA for comparison purposes with the rest of the pivot. The crops grown included: timothy hay, alfalfa, grass seed, beans, mint, silage corn, barley, potatoes, and wheat. No observable damage was done to the crops by dragging the sprinkler heads through any of the crops. The feedback from the growers has been largely positive. Almost all of those who saw it demonstrated on their farms are expanding to greater use of LESA or LEPA. Especially in Idaho, where there has been a court-ordered reduction in water rights, growers are beginning to convert pivots to LESA. Mint growers have also been converting their pivots to LEPA because of an ancillary benefit of higher mint oil yields that are likely due to water from sprinklers washing mint oil off the plant leaves. In areas where the soils are particularly sandy (less able to move water laterally in the soil) and/or if growing crops with particularly shallow root zones, it may be necessary to use a tighter spacing (2.5 to 3 feet) between their sprinkler drops. It is simple to change the LESA sprinkler spray plate. Often it’s just a matter of turning them upside down to expose a different plate to the stream from the nozzle; this widens the wetted radius. 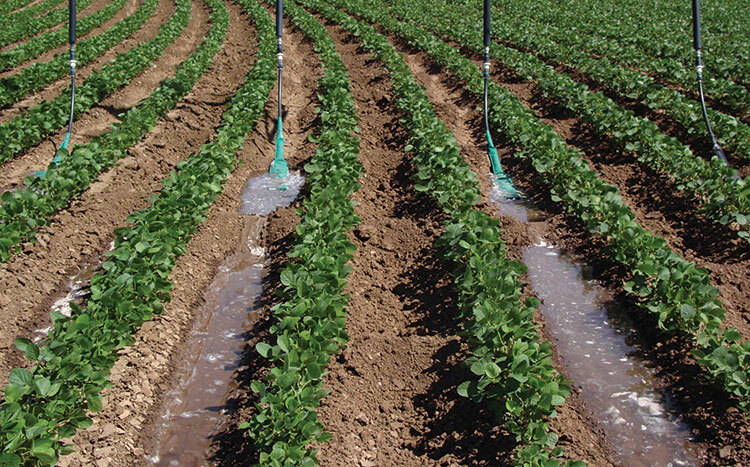 Another approach is to spray the water more upward at certain stages of the crop development to compensate for potential issues with water distribution uniformity. The wind drift losses are fairly visible under the MESA section and practically nonexistent in the LESA section where the spray heads are below the top of the wheat canopy. LEPA or LESA uses more drop hose, sprinklers, and pressure regulators and, therefore, there is a slightly higher equipment cost estimated to be about $1,000 per span, depending on a number of factors. These costs can be paid for over time by energy savings at the pump alone, even when the costs of reworking the pump to be more efficient at a lower pressure are considered. Growers who don’t have enough water and are forced to deficit irrigate their crops will realize the largest financial benefit from converting to LEPA or LESA since their ability to get more water to the crops will result in improved yields and crop quality. When all of the fixed costs of land and equipment ownership, planting, cultivating, and harvesting a crop are fairly constant, better yields and crop quality can result in disproportionately greater profit margins for the grower. In addition, LEPA and LESA not only benefit the grower but also can benefit the public at large through water and energy conservation. There are several organizations willing to cost share on the conversion costs from MESA to LESA, depending on where you live. These include Bonneville Power Administration rebates through your local electric utility, the USDA National Resource Conservation Service (NRCS), and possibly your local conservation district. Before you begin converting pivots, contact these organizations and ask about potential cost-share programs. This article appeared in the February 2017 issue of Hay & Forage Grower on pages 10 and 11.